Wikipedia turns 15 on Friday. A key element in its creators’ vision of a user-generated online encyclopedia was to make it a repository of information serving audiences in multiple languages. The first non-English versions launched shortly after the Wikipedia’s founding in 2001, with offerings in six languages – German, Catalan, Swedish, French, Spanish and Russian. Today, the site is available in 280 languages. 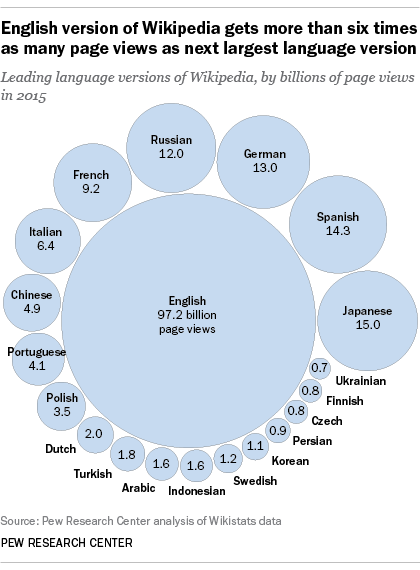 A new Pew Research Center analysis of the most visited pages in each of Wikipedia’s top 10 languages provides a window on how people in different societies and cultures use the international reference tool. Wikipedia averages more than 18 billion page views per month, making it one of the most visited websites in the world, according to Alexa.com, a Web tracking company owned by Amazon. The site adds more than 20,000 new articles each month and has 27 million registered users, according to data reported by Wikipedia. New analysis: See a list of the most visited Wikipedia articles by language in 2015. To compare different language versions of Wikipedia, Pew Research Center drew on data from stats.wikimedia.org – Wikimedia is the foundation that runs Wikipedia – for the number of overall page views. For the data regarding the top pages by language, we compiled and analyzed hourly raw page count files posted by Wikimedia. Additional analysis was performed using data compiled by Wikitrends, an independent site run by Johan Gunnarsson and based on data from Wikipedia. The top pages in the English-language version of Wikipedia are a mix of subjects that include references to current events (ISIS), websites (Facebook, Google) and popular media (a list of Bollywood films, “Star Wars,” “Game of Thrones”). The list for the Japanese version, on the other hand, is made up mostly of pop culture subjects. Seven of the top 10 pages are from the world of comics, movies or music. Sports were popular on the Spanish version – volleyball and basketball were the second and third most popular pages, respectively, while Copa America 2015 was the seventh largest. History was also popular, with World War II as the sixth largest and World War I the ninth. Social networking was popular in Russian. Rival social platforms VK and Classmates were No. 2 and No. 9, respectively. These lists of the most popular pages in 2015 also demonstrate the international popularity of American television shows and movies. The page for the movie “Star Wars: The Force Awakens” was not only sixth on the English version, but also appeared in the top 10 for Italian, Portuguese, Japanese and Polish. The fantasy TV series “Game of Thrones” was also popular. That show was among the most viewed pages in English, German, Russian, Italian and French. The TV series “The Walking Dead” and “The Big Bang Theory” also appeared among the top pages. Despite the explosion of content and Web traffic in dozens of languages, the English version is still by far the biggest and most popular. It had approximately 97 billion page views — more than six times that of Japanese, the next most popular version. The versions in three other languages, Spanish, German and Russian, had more than 10 billion page views. Further illustrating the gap in Web traffic, the most visited article on the English version, List of deaths by year, alone had more page views (20.8 million last year) than the top 10 most viewed pages in Japanese combined. 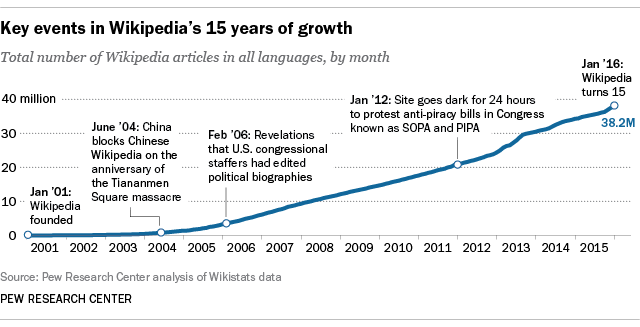 As Wikipedia grew in prominence, there were several key events that thrust it into the news. In 2004, China blocked access to the Chinese version in anticipation of the 15th anniversary of the Tiananmen Square protests of 1989. In the years since, the Chinese government has vacillated between blocking parts of the site and allowing access. In 2006, it was discovered that congressional staffers had been editing pages to make changes to political biographies. That was just one instance in a long-running list of episodes where Wikipedia posts had become a battleground for partisans or others with agendas. Indeed, the whole concept of Wikipedia wars has led to many protracted debates and eventual rule-making the community and editors of the site over how articles should be edited. The leaders of Wikipedia itself have generally stayed out of public policy disputes, with one notable exception. On Jan.18, 2012, the site went dark for 24 hours – along with thousands of other sites – to protest two anti-piracy laws before Congress known as SOPA (Stop Online Piracy Act) and PIPA (PROTECT IP Act). Many believed these laws would have led to censorship on the Web. The move was partially responsible for the decision by congressional leaders two days later to postpone the legislation. The bills have yet to be reintroduced. Michelle Atkinson is a data architect at Pew Research Center.